or to book a hunt! 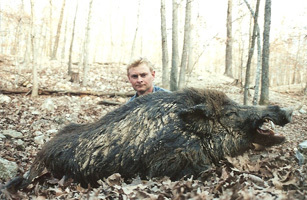 At High Adventure Ranch, we are one of the few ranches to have the prized Record Book Russian Boar available to hunt. Our pure strains have grown huge in size weighing up to 550 pounds with tusks that often protrude up to five inches. The Pure Record Book Russian Boar, original stock from Berlin Germany has been raised in the wild under fenced conditions and not allowing the local feral hogs to inbreed with our herd. These “RARE” Boars are most unique as they gain less weight per year than the five-eighths blood line of Russians. These Pure Record Book Russian Boars take five to eight years to accomplish into the 400 to 550 pound range. They have longer hair, which differs from the five-eighths variety. They also have 3 inch Plus tusks protruding from their jawbone which is truly impressive! 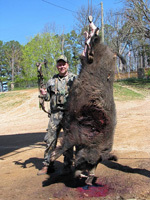 Our clients come from all over the world to hunt these Rare Prized Boars as they are not readily found anywhere else. Because of the rarity of these, many hunters get full mounts. We hunt these year round, but we only harvest a limited number each year! *Information and prices on website are subject to change without notice, please contact us for the most accurate and current information and prices. Sign up for special offers & more right in your inbox!